Is this spring coated. And is it any better than orher disconnecter springs? BEST ANSWER: Ok thank you. That is what i thought.... i purchased this and got a no coated spring. I ended up sanding and polishing the spring that came with my kit. Worked fine. Just curious if this was supposed to be coated thats all. Yes, the spring is coated. Can’t say it’s better or worse than others. Can say l’ve never had a problem with installation or function of PSA item. Spring is coated and fit securely into trigger. Some others I have used have seated properly. Hope thi helps. Yes coated and have used them before, great for building or replacing. I used a psa lower build kit about a year ago have put about 250 rounds thru it and today i have ot a double fire during 3 clips of 556. It happened 3 times so I stopped shotting. 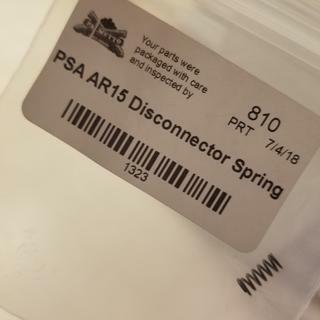 I read that it sounds like the disconnector spring, have you had trouble with them? Or any other things i cn look at. No problem up to today. Any info would help. BEST ANSWER: I've not had this problem but not really sure how many rounds I've put through it. Have multiple AR15's, more than one from PSA. I have noticed the green coating is wearing off all of them though. Did you file/stone the trigger/sear engagement at all and use a lubricant on the surface of either or use the "grip screw extender method"? Either, if not done properly, can/will screw things up.